by Genevi�ve Duboscq—How the USA PATRIOT Act affects booksellers and collectors, and what you can do about it. By Steve Schuyler—Bookseller J�rgen Holstein reveals himself to be a collector, too. 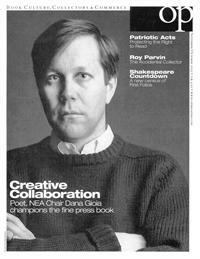 by Roy Parvin—"My intention wasn't to become a collector of books..."
Plus we reveal how Newsweek got the facts right but the story on used books wrong, that the ABAA called off talks with eBay about book fraud, and management changes at Abebooks. Dee Stewart continues her popular survey of recent bookseller catalogs, and we review four books about books.